Listening to the radio this morning there was talk that this has been the driest summer since 1929. Following on from the November floods around Cockermouth this seemed hard to believe at first so we went down to Armathwaite ( maybe 7 miles or so up river from our holiday cottages) to see what the River Eden was like. As you walk upstream from Armathwaite Bridge you come to Coombs woods and here the valley opens up very briefly with wide flat bedrock which becomes exposed when water levels drop. This creates a fascinating ecosystem as the rock pools usually get refreshed by rain and fluctuating water levels creating a rich and verdant area to explore. 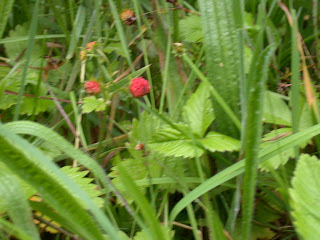 and here is a picture of the beautiful miniature wild strawberries which you can find down in these woods. and here is a picture from this week.......river levels much lower and the Penrith sandstone bedrock exposed and largely dry. So maybe in a way these things creep up on you. Because we live in such a beautiful part of the world occasionally we forget just how precious water is and how lucky we are to have these beautiful rivers. Our guests often ask our opinion as to where they can go for a lovely day out. 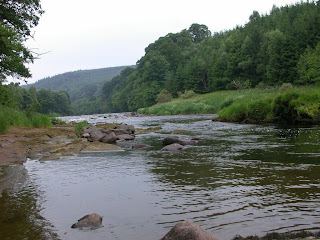 We know from experience that a trip to Hutton in the Forest can be very rewarding. 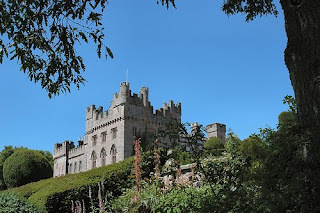 This is the ancient estate of Lord Inglewood. It has a Pele tower dating back to the 14th century. Since then it has been added to and extended over the years with quite an interesting mix of styles. When the sun is shining the gardens are a delight to explore with plenty to occupy your time from a walled garden to ponds, a woodland walk and topiary to admire. 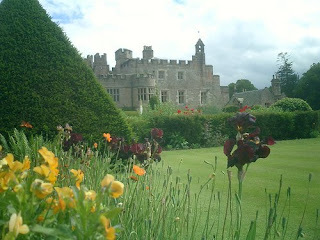 An added bonus to visiting the estate are the many events which are held in the garden and grounds. Twice a year there are the Hutton horse trials which always attract a good and enthusiastic crowd. Other events range from open air plays to BBC's antique road show and Potfest which features pottery from across the region. The house and gardens are just a little under 7 miles from our holiday cottages. However the drive there takes you across the lovely countryside between Great Salkeld and the A6 which means that a leisurely drive will get you there is a little under half an hour. This photograph of the house and garden is courtesy of ChrisinWales.